Ok. I had some trouble running the Intel Pentium III-667Mhz. processor with this motherboard since it totally wouldn't post. Not having anything else to use, I just decided on using the same Intel Pentium III-700 and see till where I could take it. 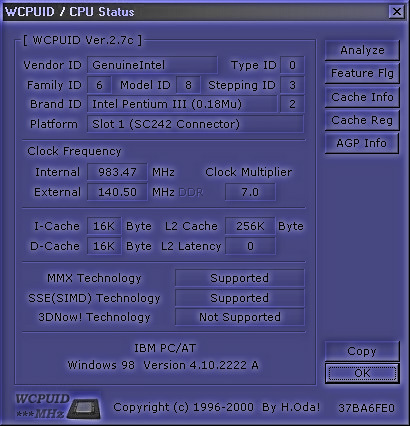 Considering that I was able to get this processor to the 1Ghz. mark with the Abit BE6-II, I was pretty disappointed that I couldn't repeat it here. The same PIII-700 was previously tested on Epox BX6 SE and it was able to run at a stable 1008 so I really don't see this as being the processor's problem. Upping the voltage on the BF6 didn't do much except increase my temperature readings. My guess is that some other component is giving out under all the stress. Anyhoo, that's really just a minor rant considering the difference in performance from 980 to 1008 will be unnoticeable. At 980, there were no seeming problems and it allowed me to run Prime95 the whole night long. What I do find amazing here (well, in all my tests actually), however, is this stick of TTI PC100 3-3-3 SDRAM that I'm using. The highest I've got it so far is 155Mhz. using an incredible 2-2-2 setting.